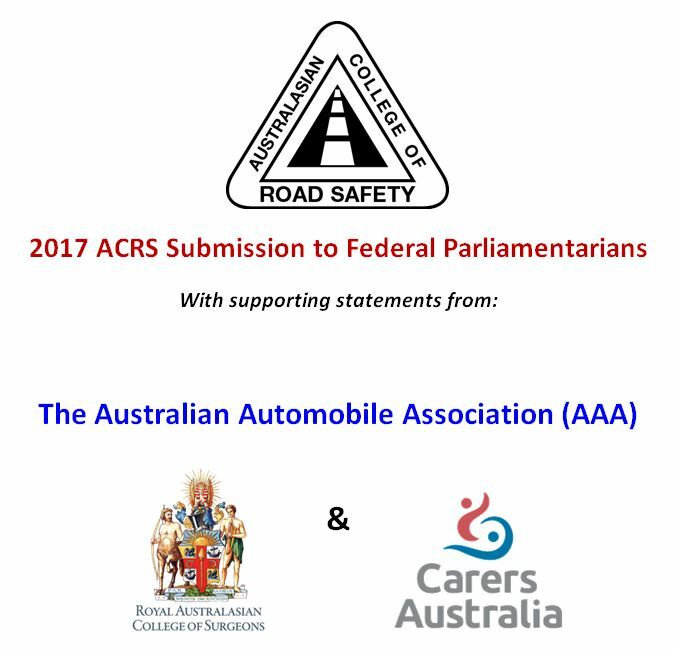 ACRS President, Lauchlan McIntosh, today released the 2017 ACRS Submission to Federal Parliamentarians - The way forward to reduce road trauma. 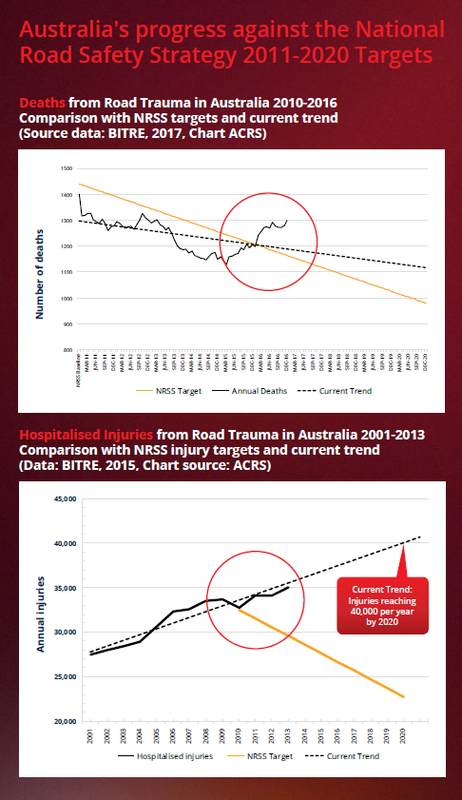 This Submission outlines Australia's stalled progress against National Road Safety Strategy 2011-2020 targets for death and injury reduction, the multi-portfolio impacts of road trauma across the spectrum of federal departments, and presents comprehensive recommendations on the way forward to reduce road trauma. "I'd like to thank our supporters, the Royal Australasian College of Surgeons, Carers Australia, and the Australian Automobile Association as peak representative bodies joining with us to emphasise the extreme importance of the issue of road trauma across our entire society," said Mr McIntosh. "In combination, our supporting organisations represent around 10 million Australians - that's 10 million of our citizens urging our elected federal representatives to unanimously reject the current increasing rate of road death and injury." "Road trauma has insidiously pervaded our society to such an extent that there now seems so to be an acceptance that this huge and growing burden of 25 deaths and 700 hospitalised injuries every week is the price we must pay for our mobility. This is just not the case." "The College brings together global and national expertise across the full spectrum of road safety, and our best minds have come together to develop and support our Submission where we outline recommendations to expedite trauma reductions." 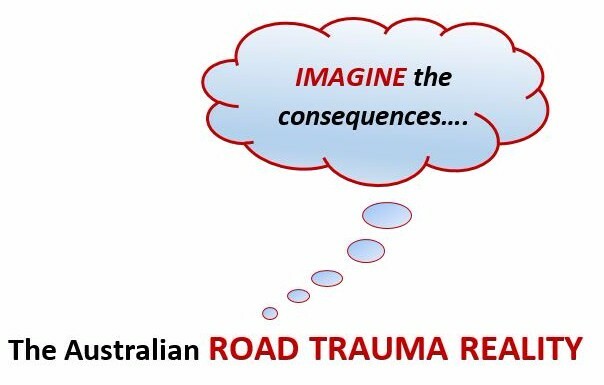 The Submission outlines 4 key recommendations underpinning future road trauma reductions, and calls for unanimous support across the political spectrum to reject the rise in deaths and hospitalised injuries. 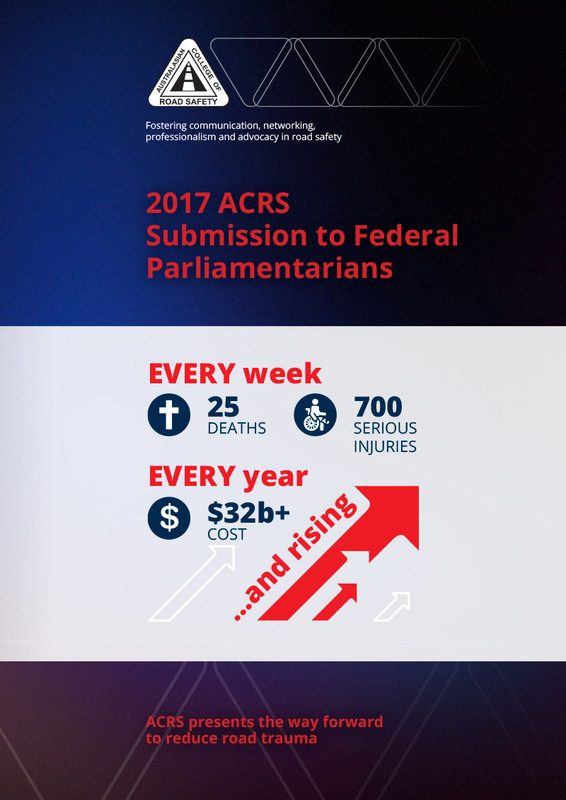 Read the Entire 2017 ACRS Submission to Federal Parliamentarians here. "Each week there are 25 deaths and 700 serious injuries on our roads (that's 1,300 deaths and 37,000 hospitalised injuries per year). Seen first-hand by our surgeons, this has an enormous impact on Australia's health system as a whole. The College supports all evidence-based initiatives that assist in the prevention of road trauma and the reduction of the devastating effects of injury". “Families experience firsthand the tragedy of these deaths and the impact of the serious injuries sustained in these accidents. Every day too many ordinary Australian families will become a caring family – this means that one or more family members will need to change their own way of life to provide support (including emotional, personal, clinical and financial) to the injured person. Australian and international research indicates that these carers are likely to have significantly lower health and well-being (including social and financial) than non-carers and that this impact increases with the duration of their caring responsibility. “In 2011 all Australian governments agreed to the National Road Safety Strategy to reduce road deaths and trauma by 30% by 2020. But with 1,300 killed on Australia’s roads in 2016, a 7.9% increase, AAA analysis shows that almost no progress has been made in reducing deaths since the Strategy was agreed. “At a time when new vehicles and roads have never been safer, we need to understand why 40 years of improvement is being reversed. With 1,300 dead and tens of thousands more now dealing with life-changing injury as a result of crashes in 2016, the human cost is immense. Additionally, the annual cost to our economy is around $34 billion. The Australasian College of Road Safety calls on all Federal Parliamentarians to unanimously reject the current increasing rate of road death and injury, and commit to the ultimate goal of eliminating fatalities and serious injuries on the road. 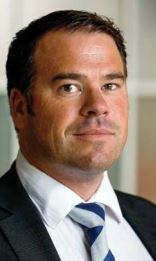 The Australasian College of Road Safety calls on the Federal Government to task the Productivity Commission with undertaking a full inquiry into the impact of road trauma on Australia’s productivity, and the national investment and policy decisions required to achieve the nation’s policy goals of a safe road transport system. Ensure all new vehicles (cars, vans, motorcycles, buses and trucks) are equipped with world best practice safety technology and meet world best practice crash-worthiness. 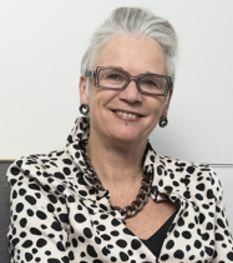 The Australasian College of Road Safety calls on the Federal Government to establish a six-monthly forum for national stakeholders seeking to support significant improvements in road safety. The purpose of the forum would be to review progress in road safety at a national level, and discuss key initiatives for significantly improving results. Imagine if our nation was providing a defence force to combat war overseas, and that 25 soldiers were dying and 700 were being seriously injured each week - week after week, year after year. Imagine if there was no end in sight, and the wartime fatalities had increased in the last calendar year compared to the year before. The public and political pressure to end these mass casualties would be immense. Imagine if there were 5 Boeing 737 crashes every week in Australia, with 25 passengers dying and 700 being seriously injured each week. The public outcry would be enormous, the effects on our nation soul destroying. Every effort would be made to stem this tide of death and injury. Imagine if there was an epidemic that consistently, year after year, was the leading cause of casualty in our population for 1-14 year olds. Imagine if it was the 2nd highest cause of death and injury in our young people between the ages of 15-24. The forces mobilised to counteract this epidemic would be enormous. Imagine the effects on health systems if our hospitals were dealing with the injured from these plane crashes, war events or epidemics – 700 people each week - reaching the emergency doors with serious injuries, enduring lengthy hospital stays and for some a lifetime of disability. Imagine the strain on our disability services and community support structures if our communities were dealing with these injured people –700 people per week - some requiring extensive and costly lifetime support. Imagine the consequences of these deaths and injuries on our communities – the 25 deaths each week resulting in outpourings of grief from our families and communities, and the 700 people each week who are released from hospital, some to be cared for by families and communities over the longer term. Imagine if the annual cost to our economy of these plane crashes, wartime efforts or epidemics was estimated to be over $27 billion in 2011, and had risen to at least $32b by 2016, and continued to increase each year over and above CPI. This is more than Australia’s current annual defence budget of $31.9b (Department of Defence, 2015). The political and social pressure to solve this problem would be enormous. 25 people dead and 700 seriously injured every week in Australia. Week after week. Year after year. And Rising. The impact of road trauma is all-encompassing, impacting the full spectrum of the political agenda. A much stronger focus on saving lives and injuries on our roads, covering all age groups and user groups, all the factors in roads and vehicles, and including all facets of road crashes such as trauma services and post-crash care, would have a major impact on Australia’s economic and social well-being. There are many simple and cost-effective solutions. The College urges all federal politicians to raise the profile of road trauma across our nation and internationally, and provide strong leadership and support for a coordinated approach towards road trauma reductions. About the Royal Australasian College of Surgeons: The Royal Australasian College of Surgeons (RACS) is the leading advocate for surgical standards, professionalism and surgical education in Australia and New Zealand. The College is a not-for-profit organisation that represents around 7,000 surgeons and 1,300 surgical trainees and International Medical Graduates. RACS also supports healthcare and surgical education in the Asia-Pacific region and is a substantial funder of surgical research. About Carers Australia: Carers Australia is the national peak body representing Australia’s carers, advocating on behalf of Australia’s carers to influence policies and services at a national level. Australia has over 2.7 million carers, 12% of the population. The replacement value of the unpaid care provided in 2015 was $60.3 billion - over $1 billion per week. Carers are people who provide unpaid care and support, are an integral part of Australia's health system, and are the foundation of our aged, disability, palliative and community care systems. About the Australian Automobile Association (AAA): The AAA is the peak organisation representing Australia’s motoring clubs, with a combined membership of seven million Australians. The AAA aims to represent and advance the interests of the constituent motoring clubs and their members to the Australian Government and other national and international stakeholders. National Road Safety Strategy 2011-2020: Australian Transport Council (2011). Copyright © ACRS All rights reserved.